A Preview of Coming Wars: Do Black Lives Matter in Africa? Reading Nick Turse’s new book, Tomorrow’s Battlefield: U.S. Proxy Wars and Secret Ops in Africa, raises the question of whether black lives in Africa matter to the U.S. military any more than black lives in the United States matter to the police lately trained and armed by that military. Turse scouts out the still little told tale of U.S. military expansion into Africa over the past 14 years, and primarily over the past 6 years. Five to eight thousand U.S. troops plus mercenaries are training, arming, and fighting alongside and against African militaries and rebel groups in nearly every nation in Africa. Major land and water routes to bring in the U.S. armaments, and all the accouterments of bases housing U.S. troops, have been established to avoid the local suspicions created by building and improving airports. And yet, the U.S. military has proceeded to acquire local agreements to make use of 29 international airports and gotten to work building and improving runways at a number of them. 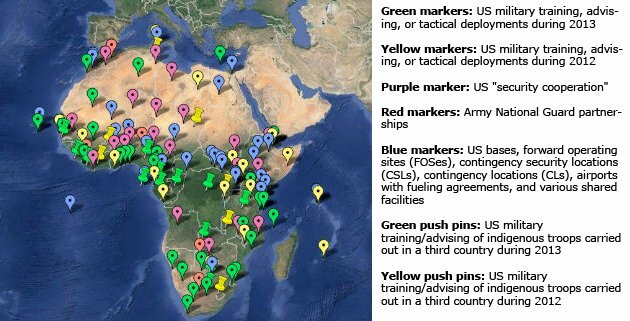 The U.S. militarization of Africa includes airstrikes and commando raids in Libya; “black ops” missions and drone murders in Somalia; a proxy war in Mali; secretive actions in Chad; anti-piracy operations that result in increased piracy in the Gulf of Guinea; wide-ranging drone operations out of bases in Djibouti, Ethiopia, Niger, and the Seychelles; “special” operations out of bases in the Central African Republic, South Sudan, and the Democratic Republic of Congo; CIA bungling in Somalia; over a dozen joint training exercises a year; arming and training of soldiers in places like Uganda, Burundi, and Kenya; a “joint special operations” operation in Burkina Faso; base construction aimed at accommodating future “surges” of troops; legions of mercenary spies; the expansion of a former French foreign legion base in Djibouti and joint war-making with France in Mali (Turse must be reminded of that other wonderfully successful U.S. takeover of French colonialism known as the war on Vietnam). AFRICOM (Africa Command) is in fact headquartered in Germany with plans to be based at the giant new U.S. base built in Vicenza, Italy, against the will of the Vicentini. Important parts of AFRICOM’s structure are in Sigonella, Sicily; Rota, Spain; Aruba; and Souda Bay, Greece — all U.S. military outposts. Recent U.S. military actions in Africa are mostly quiet interventions that stand a good chance of leading to enough chaos to be used as justifications for future public “interventions” in the form of larger wars that will be marketed without mention of their causation. Future famous evil forces that may one day be threatening U.S. homes with vague but scary Islamic and demonic threats in U.S. “news” reports are discussed in Turse’s book now and are arising now in response to militarism rarely discussed in corporate U.S. news media. 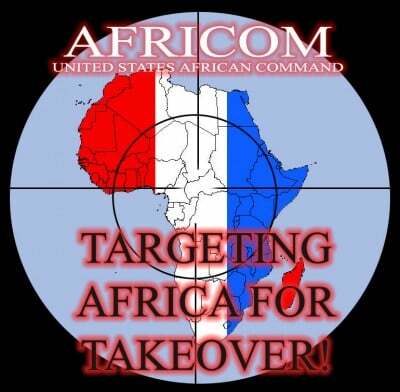 AFRICOM is advancing with as much secrecy as it can, trying to maintain the pretense of self-governance by local government “partners,” as well as to avoid the scrutiny of the world. So, it hasn’t been invited by public demand. It isn’t riding in to prevent some horror. There has been no public debate or decision by the U.S. public. Why, then, is the United States moving U.S. war making into Africa? AFRICOM Commander General Carter Ham explains the U.S. militarization of Africa as a response to the problems it may in the future manage to create: “The absolute imperative for the United States military is to protect America, Americans, and American interests [clearly something other than Americans]; in our case, in my case, to protect us from threats that may emerge from the African continent.” Asked to identify such a threat in current existence, AFRICOM cannot do so, struggling instead to pretend that African rebels are part of al Qaeda because Osama bin Laden once praised them. During the course of AFRICOM’s operations, violence has been expanding, insurgent groups proliferating, terrorism rising, and failed states multiplying — and not by coincidence. The reference to “American interests” may be a clue to real motivations. The word “profit” may have been accidentally omitted. In any case, the stated purposes are not working out very well. The 2011 war on Libya led to war in Mali and anarchy in Libya. And less public operations have been no less disastrous. U.S.-backed war in Mali led to attacks in Algeria, Niger, and Libya. The U.S. response to greater violence in Libya has been still more violence. The U.S. embassy in Tunisia was attacked and burned. Congolese soldiers trained by the United States have mass raped women and girls, matching the atrocities committed by U.S.-trained Ethiopian soldiers. In Nigeria, Boko Haram has arisen. The Central African Republic has had a coup. The Great Lakes region has seen violence rise. South Sudan, which the United States helped to create, has fallen into civil war and humanitarian disaster. Et cetera. This is not entirely new. U.S. roles in instigating long wars in Congo, Sudan, and elsewhere predate the current Africa “pivot.” African nations, like nations in the rest of the world, tend to believe the United States is the greatest threat to peace on earth. Someone recently told me that China had threatened to cut of U.S. billionaire Sheldon Adelson’s profits from casinos in China if he continued to fund Congress members who insisted on going to war with Iran. The alleged motivation for this was that China can better buy oil from Iran if Iran is not at war. True or not, this fits Turse’s description of China’s approach to Africa. The U.S. relies heavily on war making. China relies more on aid and funding. The U.S. creates a nation doomed to collapse (South Sudan) and China buys its oil. This of course raises an interesting question: Why can’t the United States leave the world in peace and still, like China, make itself welcome through aid and assistance, and still, like China, buy up the fossil fuels with which to destroy life on earth by means other than warfare? The other pressing question raised by the Obama government’s militarization of Africa, of course, is: Can you imagine the ear-splitting everlasting biblical proportions of the outrage had a white Republican done this?